Tattoos and the art of tattooing has been around for thousands of years, and has penetrated just about every culture. Over the years, the taboo surrounding tattoos has diminished and has become more accepted. However, despite this widespread acceptance, in certain cultures tattoos are still regarded as “unacceptable”. The fitness industry being one of them. What we use to adorn our bodies in the ultimate sacrifice for art, forever etching it into our skin, is looked upon by judges in competition as a flaw. And I have to agree. 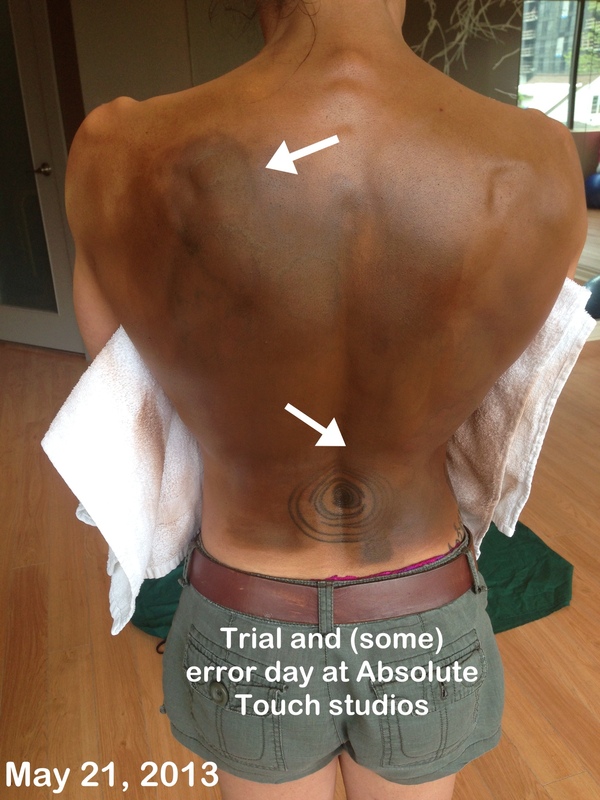 Tattoos blur the lines of muscle definition and could mean the difference between 1st or 2nd place. As you advance each level the expectancy as well the calibre of other athletes which you will be up against gets tougher. Therefore I will advice you to continuously improve in area such as shoulder caps to help improve the lines. From show to show you can never predict who and how they will come up against you. 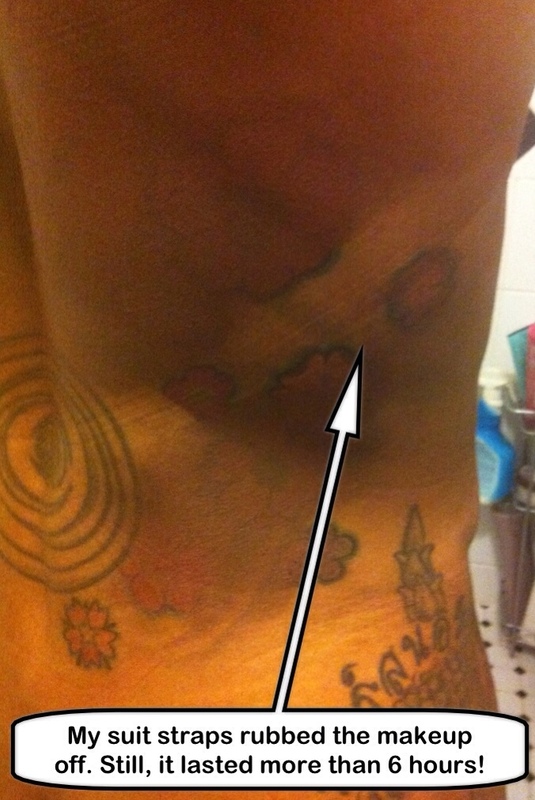 Your tattoo in some ways can be a disadvantage. Due to the shape and contrast of you muscle tone, which can be hidden by it. Therefor you have to ensure those particular areas can produce the look where is visible to the judges at a fast glance. For this reason you need to build out your delts. I already had a few pieces – hip, lower back, forearms. 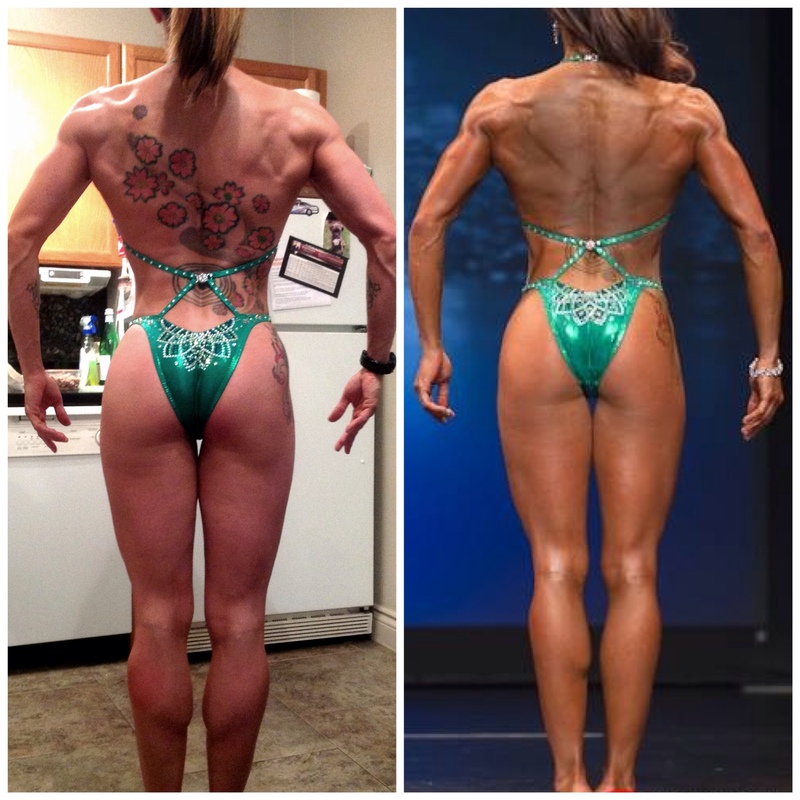 None of which really affect my physique or definition on stage because of their position. But, towards the end of last competition season I was planning my next instalment: a large back piece. I had to wait until my last show to start the process so that it would be fully healed before using any stage tanner, which could cause it not to heal properly. Some beautiful work, done by the uber talented David Glance of Archive Tattoo. But, given the size of the tattoo, and the shape, I knew it would affect my physique. The curve of the design would make the judges perceive an unsymmetrical physique. I couldn’t have that. Therefore, not wanting to be judged on my lifestyle choice, I decided that my rather large back piece should be covered up for Provincials. David put me in touch with makeup artist, Angie Di Battista. He told me she did some great cover-up work, on a sleeve he did, for a bride on her wedding day. I contacted Angie. Up until me, she did mainly cover-ups for brides. Fitness is a little different. And so, we started out on our adventure of trying to find the ultimate cover-up formula that would withstand the stage lights, sweating, and a long competition day. We also had to figure out what would work with the dark spray tan figure competitors use, since it isn’t your average fake tan. The first test run was during the Mike Davies fitness camp weekend. For our first attempt, it wasn’t a bad result. And even held up pretty good after a weekend of full-on sweating! Only problem was, it didn’t look like my real skin. On a much bigger area, like my back, the latex makeup would be more distracting than covering. I was disheartened. Angie was determined! We planned to meet again, with Pam Bortmes of Absolute Touch, the official spray tanner of the Ontario Physique Association. Angie had some other makeup solutions to try out, and she wanted to see if it worked with the stage tan. The top arrow in the photo above shows a fail. I can’t remember what Angie used, but it didn’t work. The lower arrow was on the money. It looked like my own skin and was a pretty close match in colour to the stage tan. 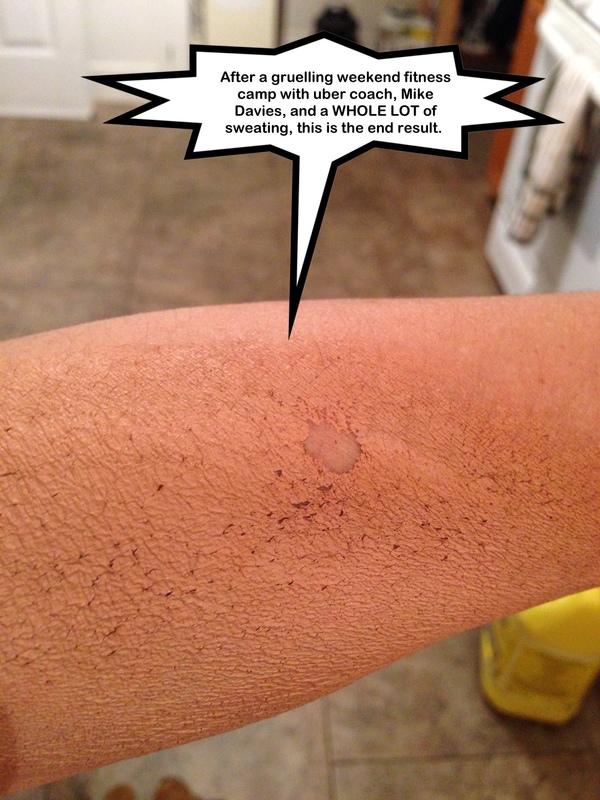 More importantly, it was locked on my skin – that makeup wasn’t going to budge! Perfect!! 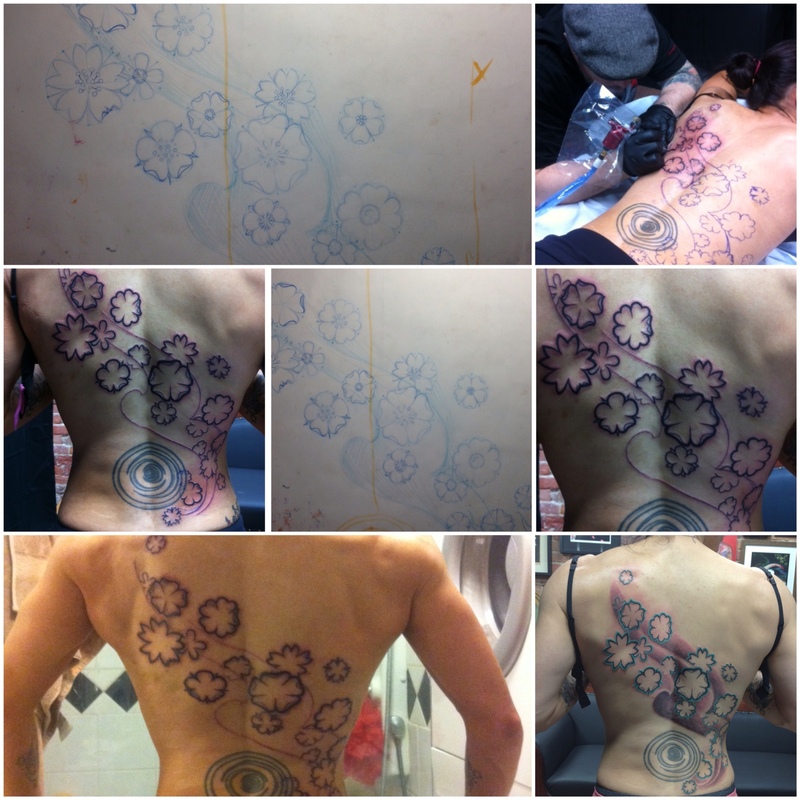 The morning of the June 1st, Toronto Pro SuperShow, Angie came over to my house around 3am to start the cover-up. THANK YOU, Angie! Neither one of us were sure how long it would take, so we erred on the side of caution and started early. This is how it looked before leaving my house, and my tan touch up, on show day. And this was taken after another coat of stage tan. I had definition back! Close up you could see there was some sort of shadow across my back. But, to judges who didn’t know I had a tattoo, it just looked like the stage tan was layered on a little darker in that area. It was pretty convincing. I got 1st place in the above class, Figure Masters Short. I wonder if I would have placed differently if I hadn’t covered up my tattoo? Those girls up there have pretty amazing physiques. Below is a good example of how the eye is drawn to the shape of the tattoo, which takes away from my symmetry and shoulder/lat width. It was a long, and rewarding, day. I have Angie to thank for securing my 1st and 2nd place finishes. Her amazing talent is obvious in her work. 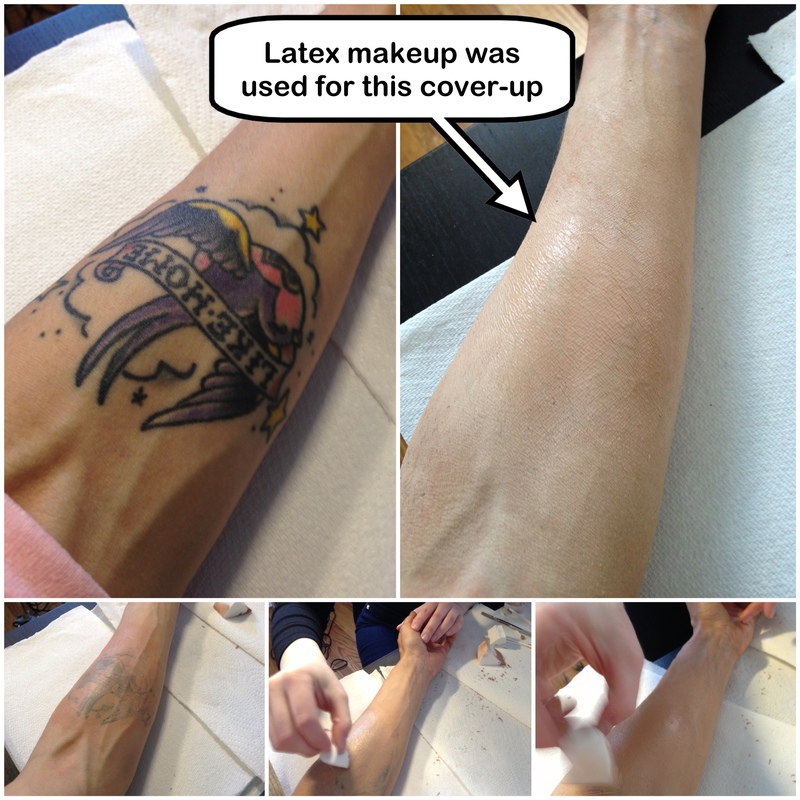 At the end of the show, 15 hours later, this is a close-up of how the cover-up wore…. What brand makeup did you use and is it expensive? It’s heavy duty stage makeup stuff. I can’t remember the name of it though 😦 I want to say Ben Nye, but I am pretty sure that’s just the powder we used to cover it. You can contact Angie through the link in my post, she’s the artist that created the cover-up magic. She’s also super sweet and helpful!